The name was recorded in 1762. 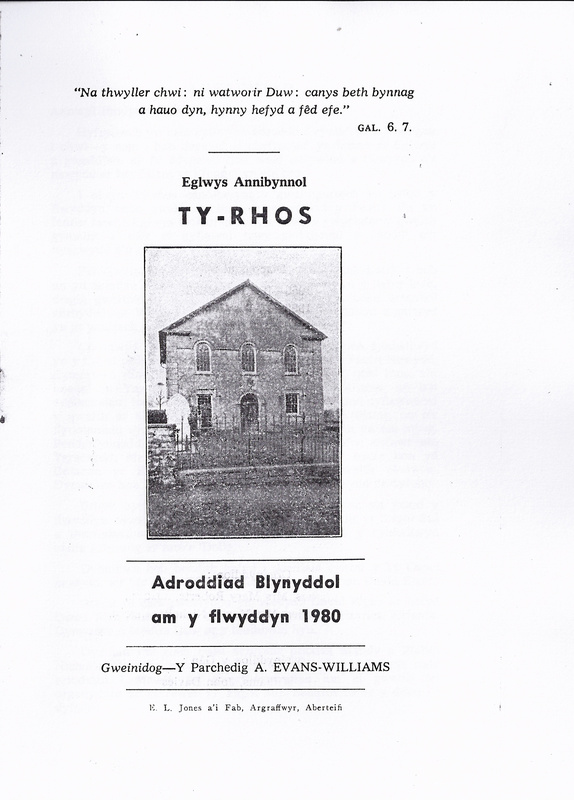 The Independent chapel, styling itself “Ty Cwrdd y Rhos”, was formed in a house named Tyrhos. It initially consisted of 19 members from the surrounding chapels:- John Jones, David Luke, Margaret Luke, David Edwards, Mary Edwards, David Morris, David Williams, Martha Williams, Margaret Rees, Frances Rees, Martha Richards, Ann Rees, John Jenkins, Hannah Thomas, William Ladd, Elizabeth John, Ann Morgan, and Margaret Edward. 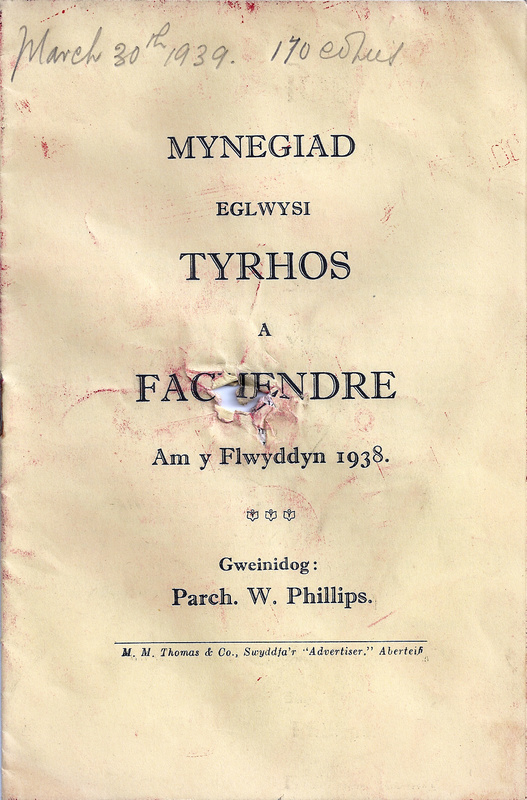 The work of the ministry was shared between Messrs. Jones, Trelech; George, Brynberian; Griffiths, Glandwr; Phillips, Trewyddel; Davies, Abergwaun, and Harries, Rhodiad. The first person to be confirmed here was William John of Rhiwgoi, in 1811. He and John James, Trewaddon were the first Deacons. Both were long serving and were regarded as good and honest men. 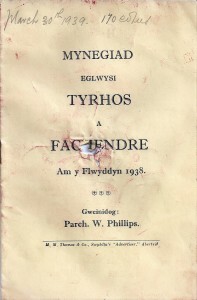 Another supporter of the cause at that time was Thomas Thomas of Pantycymro. In 1814 Rev. 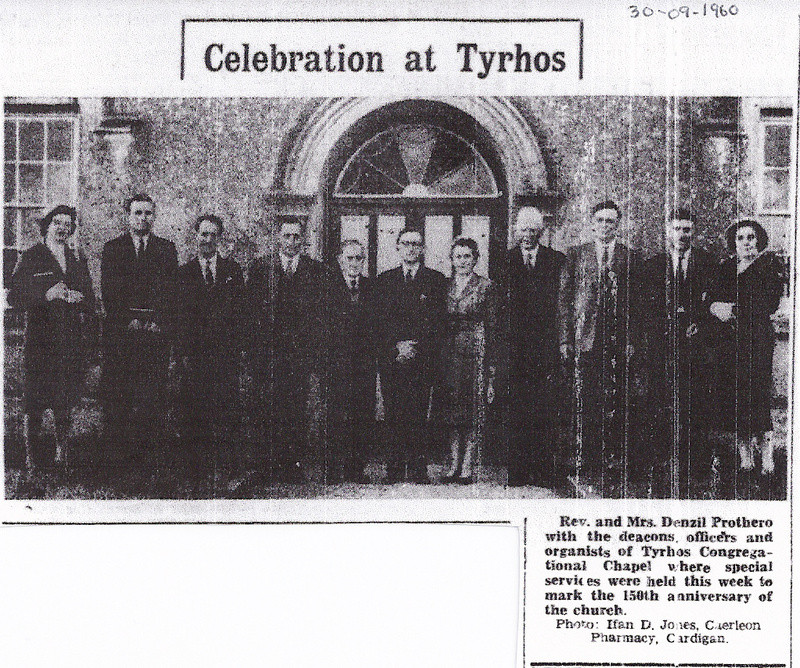 Daniel Davies of Capel Mair, Cardigan, became the first Pastor, later assisted by William Miles, Werngoi. In 1815 a piece of land was acquired for 1s. 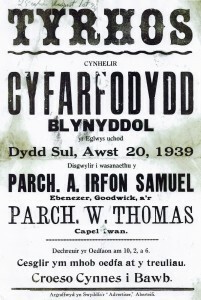 a year from Mr. Benjamin Evans, Gorsfaith, who owned half of Tyrhos Farm. It was enough to build a chapel and a burial ground. 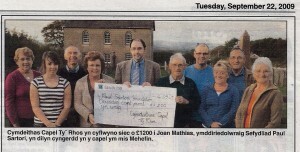 The chapel was rebuilt about the year 1815 through the efforts of Cardigan minister, Rev. Daniel Davies. The chapel was then laterally-fronted with stone steps leading to the loft. The first to be buried in the cemetery was Esther Luke, the wife of John Luke, Morfa, Blaenffos, on 31st December 1817, aged 26. William Miles preached here and acted as assistant Minister. By 1836 there were 139 members. In 1851 the Deacon, David Thomas, had 180 attendees plus 30 scholars on Sunday mornings, and 100 attendees and 20 scholars in the evening. Rev. John Davies, Moylegrove, was briefly the Minister here early in 1856. On 12th and 13th August 1856 Rev. 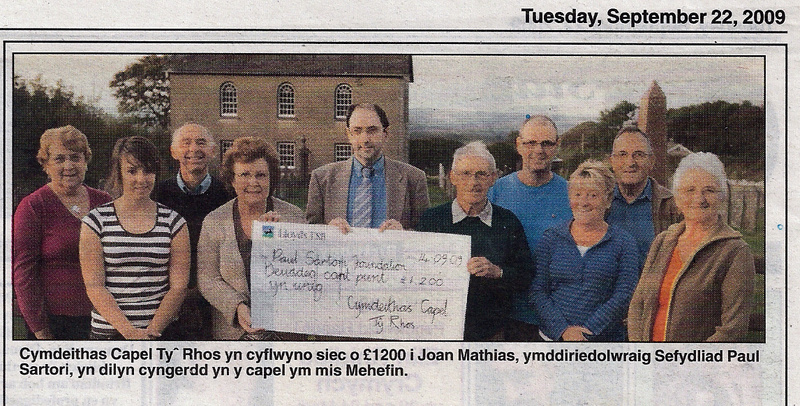 Rees Morgan of Brecon College was inducted as the Minister here and at Hen Gapel, Llechryd. 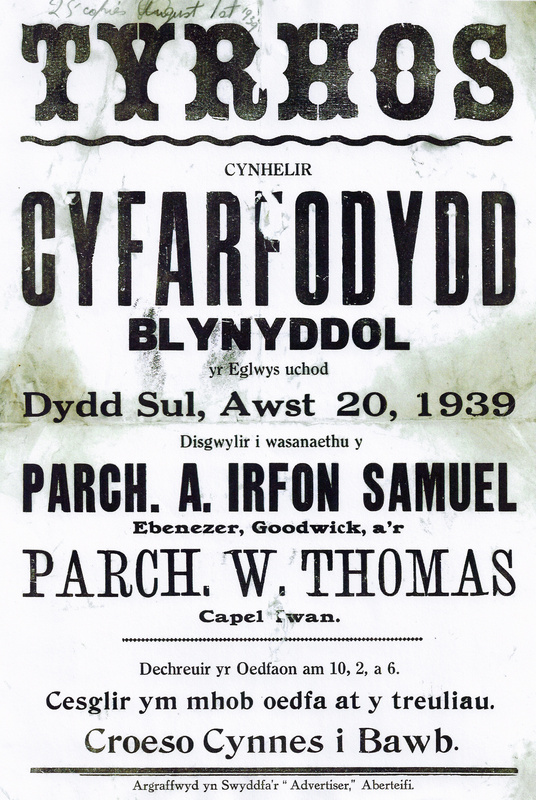 In 1859 a piece of land was sold to the congregation by Mr. Simon John, Clyngwyn, the nephew of the man that gave them land originally, and as they paid him for the land, Mr. John returned it all to them. The chapel was rebuilt in 1859 at a cost of about £500. Rev. Rees Morgan left for Glyn Neath in 1863. On 25th October 1865 Rev. Edwin Jones, a Llechryd schoolmaster, became the Minister here, and at Capel Degwell in St. Dogmaels. In mid-1867 he left for Brynmawr, Monmouthshire. In February 1868 Rev. John M. Davies of Maescwmwr, Monmouthshire, was inducted as the Minister. In 1868-95 Rev. 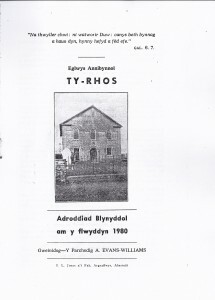 J. M. Davies was the Pastor of Tyrhos and Capel Degwell. In 1881 about 40 members left to establish Fachendre Chapel. On 27th July 1888 Ruth Davies, wife of the Rev. J. M. Davies, Minister, died aged 40. In November 1895 Rev. T. Gwernogle Evans became the Minister. In 1895-1905 Rev. T.
Gwernogle Evans was the Minister. On 8th April 1897 former minister Rev. J. M. Davies died aged 71. In December 1905 Rev. 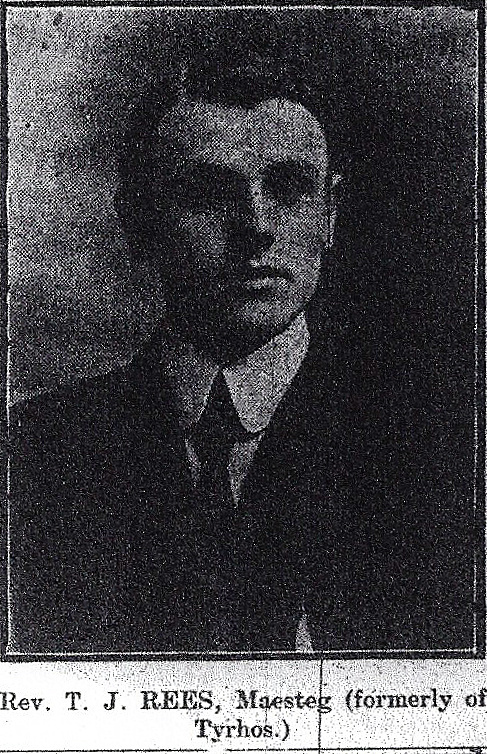 T. Gwernogle Evans left. On 11th 12th September 1907 Rev. T. J. Rees was inducted as the Minister. On 30th August 1911 Rev. T. J. Rees, the Minister, departed. On 18th October 1914 Rev. R. H. Williams was inducted as Minister. 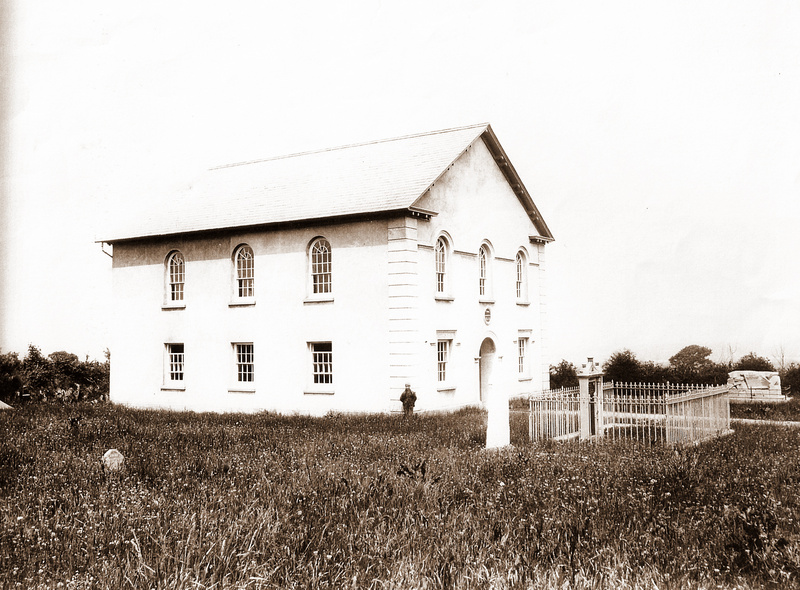 In March 1915 the congregation elected to build a Manse for their new minister – Rev. R. H. Williams. On 16th February 1928 Rev. William Phillips was inducted as the new Minister. In 1928-1953 Rev. William Phillips was the Pastor. 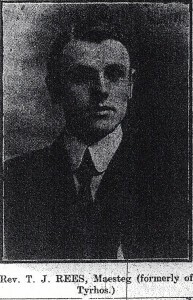 On 9th January 1936 Chapel Secretary David Davies of Rhoshill died. Rev. Denzil Protheroe became the minister in 1954 and was the Minister in 1954-62. 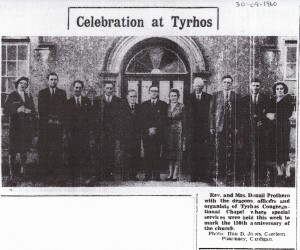 In 1956 Brinley Richards and Dan Davies became Deacons. In 1963 John B. Evans, Elfan Lewis, Huw Phillips and Gwyn Williams became Deacons and Brinley Richards became the Secretary. In 1966-71 Rev. Irfon Gwyn Jones was the Minister. In 1971-1994 Rev. Arthur Evans-Williams was the Minister. In 1976 Peter Williams became the Treasurer. In 1980 Peter Williams became a Deacon. In 1980 membership fell from 67 to 64. The chapel exterior was renovated in 1983. In 1988 Emyr Phillips became the Secretary. In 1990 Emyr Phillips became a Deacon. The other Deacons that year were Brinley Richards, Dan Davies, Elfan Lewis, Huw Phillips, Gwyn Williams and Peter Williams. The chapel was listed in 1994. By 1995 until at least 2007 Rev. Islwyn Selby was the Minister. In 2002 the Deacons were Brinley Richards, Dan Davies, Gwyn Williams, Peter Williams and Emyr Phillips. In November 2003 the former Minister, Rev. 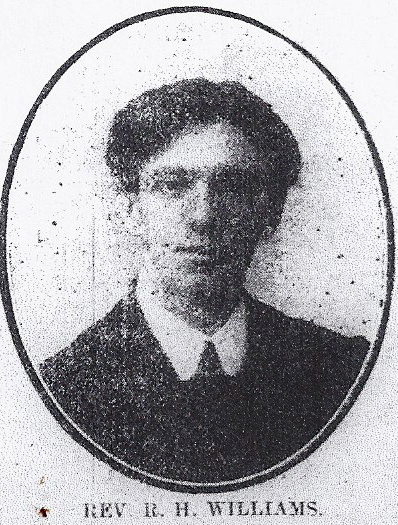 Arthur Evans-Williams, died. In 2003 Delyth Jenkins, Rayanne Thomas and Alun Thomas became Deacons, joining Brinley Richards, Dan Davies, Peter Williams and Emyr Phillips. In 2007 Deacon Alun Thomas died. 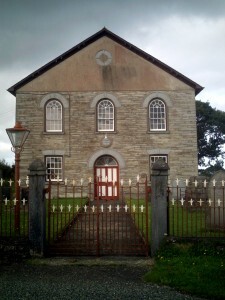 “…EXTERIOR – 1859 Independent Chapel, in rubble stone with cut Cilgerran stone dressings, slate roof and paired brackets to eaves. Gable-fronted two-storey 3-bay elevation, with arched small-paned windows above, cambered-headed 16-pane sashes below and centre arched doorway with double 4-panel doors and radiating-bar fanlight. All the window heads are in cut stone, recessed with raised keystones. Slate sills. The gable has paired brackets, later C20 render and a small keyed roundel in cut stone. Over the door is a roundel plaque ‘‘Tyrhos Congregational Chapel Built AD 1815 Rebuilt AD 1859′.’Three-window rendered side walls with similar windows. INTERIOR – Three-sided gallery on six marbled columns, raised above the level of the pews, the gallery front high and vertically panelled. Pine pews. Plain great seat. Arched recess behind the balustraded pulpit. Lobby has a traceried centre window with coloured glass panes, gallery stairs in angles. 1881 front spearhead rails on low coped wall with gateway of two plain slate piers with pyramid caps. Double gates with wrought iron scrolls and spearheads.